Aizawl, Oct 29 : In Champhai North, Champhai South and East Tuipui — three of Mizoram’s 40 assembly constituencies south-east of capital Aizawl — wine is the guiding spirit of the people when it comes to elections, given that all three constituencies fall in the grape-growing belt. The three constituencies have 33,000 voters and 25% of them are linked to the grape-growing business. In 2008, the three constituencies voted out the Mizo National Front (MNF), which had fought the anti-liquor church, to end a 13-year wait for wineries. And now, some 3,000 grape growers of the area are unhappy with the Congress, which facilitated those wineries. No apparent logic, but the determining factor is always wine. The area’s wine-connect goes back a little more than a decade. Farmers here rode a horticulture wave to cultivate the prescribed Bangalore Blues grapes, not popular as table fruit but apt for making wine. 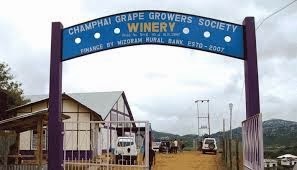 But it turned out that Champhai was too remote for its grapes to be economically viable for wineries beyond Mizoram. The alternative — setting up wineries near the vineyards — was not easy especially as the influential church had in 1997 made the state government enforce the Mizoram Liquor Total Prohibition (MLTP) Act. The MNF government managed to convince the church and the MLTP Act was amended in 2007 but MNF chief Zoramthanga lost both the Champhai North and Champhai South seats he contested a year later, possibly because of his disconnect with local issues due to anti-incumbency. The Congress pursued the wineries after coming to power in 2008 and production of red port wine with 14% alcohol content began in 2010, but the church soon intervened, forcing the government to lower the alcohol level to 11%. It did not please consumers. “The demand fell subsequently,” said R Thangseia, general secretary of Champhai Grape Growers’ Society. The Congress government, he added, has ignored pleas for fiscal aid towards expanding the wine business and boosting its demand.